If you peruse my blog, you will notice that one type of food is conspicuously missing: Pancakes. It’s not that I hate pancakes. I quite like them. But I am usually to lazy to make them. Now you’re probably wondering, are pancakes that hard to make? And surely you have more complex recipes than pancakes on your blog? And the answer to those questions is yes, and yes. But for some reason I just have a mental block with pancakes, and I think it’s because I’m a food photographer. I know that if I make pancakes, I’m going to want to take at least a few action shots where I’m drizzling syrup onto the pancakes. And those photos will take some time to get right (always worth it though! ), in which time the pancakes will (a) get cold and (b) get drowned in an inordinate amount of maple syrup. And I really love eating pancakes warm and don’t like them swimming in syrup. Cold pancakes taste like cardboard to me, and drenched pancakes taste like mush to me, and I’d rather go hungry than eat either variety. I finally solved this seemingly intractable dilemma by resolving to eat a few pancakes BEFORE photographing them so I could enjoy them warm and with the appropriate amount of syrup, and then take time to get the photos I wanted. Genius, right? Now that I’ve given you my whole history with pancakes, let’s talk about this recipe! These Vegan Quinoa Buckwheat Pancakes are probably the healthiest pancakes I’ve ever made, and I am pretty proud of them. They are vegan, gluten-free, and free of refined flours and sugars. But they still taste pretty damn good! See, you CAN have your cake (pancakes) and eat it too. The star ingredients are quinoa flour and buckwheat flour. I decided to combine these two because (a) my friend Natalie of Feasting on Fruit made these crazy cool quinoa pancakes last year that have always appealed to me, and (b) I recently had buckwheat pancakes at brunch and was very impressed. Of course, if you don’t have both of those flours, try using just one of them and doubling the amount. And if you want to use both types of flour but don’t want to buy both, you can make your own! I’ve included links to how-to-videos in the recipe below. The remaining ingredients and directions are pretty simple and straightforward for anyone who has ever made pancakes. A few tips to help you succeed with these pancakes. Resist the urge to over mix the batter. It will get really thick if you do. But, don’t be alarmed if the batter is thick. 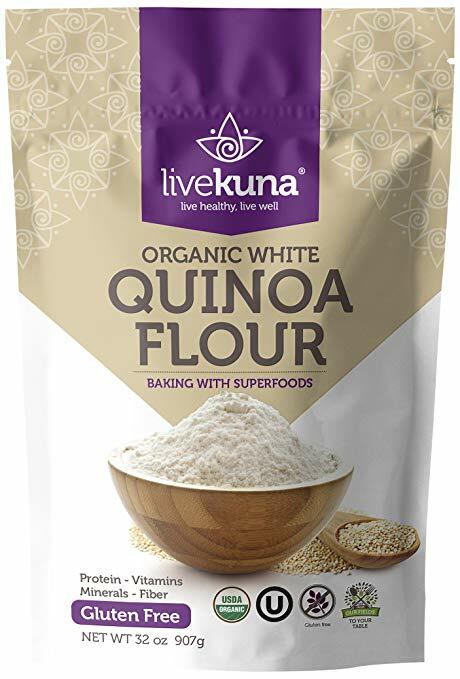 It should be quite thick, as quinoa and buckwheat flours are more dense than all-purpose flour! Don’t worry, the pancakes don’t end up undercooked or lumpy. If the pancake batter seems too thick to spread into a pan, add a bit more water and whisk to combine. Allowing the batter to rest before cooking helps everything mesh together and causes the baking powder to react with the vinegar. That reaction causes those cute little bubbles to form on the surface and gives these pancakes a bit of a rise. 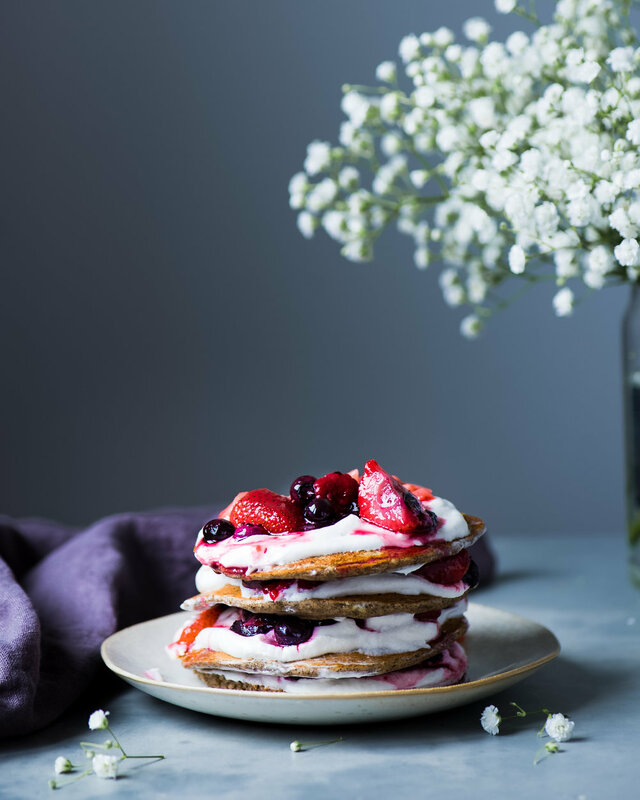 When it comes to serving these pancakes, you can’t go wrong with a little pure maple syrup and fresh berries, but I recommend making the Roasted Berries below. It’s a simple, hands-off recipe that is so delicious. Just toss a mixture of your favorite berries with a little sweetener and roast in the oven until they’re soft and syrupy. And with a little dollop of vegan whipped topping or coconut whipped cream, it is the perfect indulgent yet healthy treat. 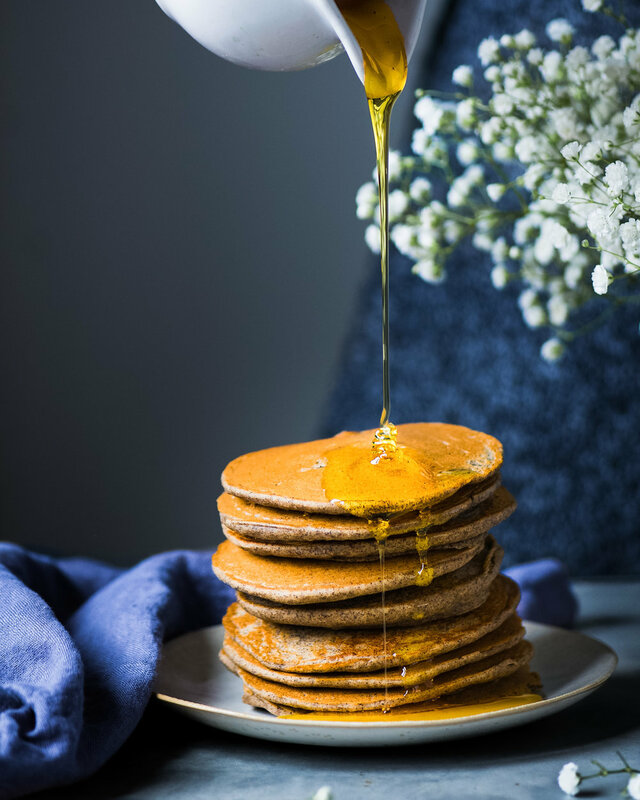 If you’re looking for even more delicious ways to top your pancakes, here are some ideas to get you thinking outside the box! Go savory! Omit the maple syrup called for in the recipe and top this with your favorite savory topping, like the creamy mushrooms in this recipe or this wild mushroom and tomato ragu. If you make these pancakes, be sure to tag me on Instagram! Bon Appétit! *To make your own buckwheat flour, see this guide. **To make your own quinoa flour, see this video. Shake the can of lite coconut milk. 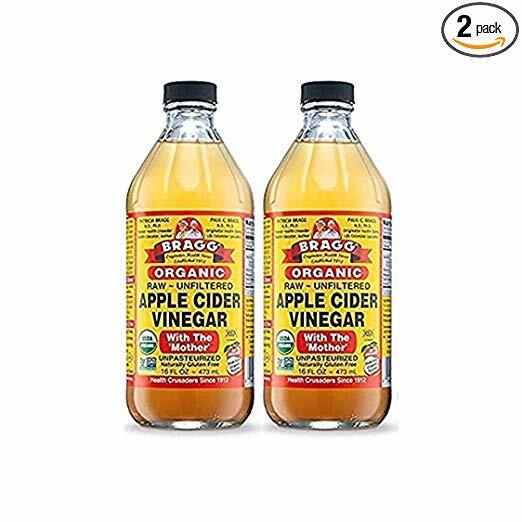 Then pour 1 cup of the milk into a medium bowl and whisk in the apple cider vinegar. Let the mixture rest for 5 minutes. In a large bowl, combine the buckwheat flour, quinoa flour, arrowroot powder, salt, baking powder, and baking soda. Whisk together to remove any clumps. To the bowl with the coconut milk, add the applesauce, maple syrup, and vanilla, and whisk to combine. Pour the wet ingredients into the dry, along with the 1/4 cup water. Gently mix with a whisk or wooden spoon just until combined and no lumps remain. Do not over mix. If the batter is too thick, add a bit more water and gently whisk. Allow the batter to rest for 10 minutes before cooking the pancakes. While the pancakes are resting, heat a large nonstick frying pan on medium-low heat. Allow the pan to heat up fully. 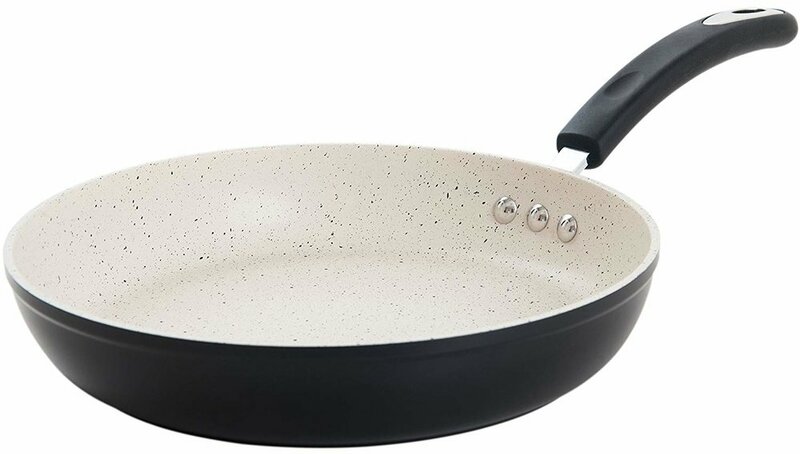 To test if the pan is hot enough, add a droplet of water into the pan. If it starts sizzling immediately, it is hot enough. Once the pan is hot enough, add a bit of coconut oil or other oil to prevent sticking. Pour a scant 1/3 cup batter into the pan and spread into a circle. Lightly smooth out the top so the batter is evenly distributed. Cook for 2-3 minutes or until bubbles start to form and you can easily slide a spatula underneath the pancakes. Flip and cook for 1 minute on the other side. Repeat until you’ve used up all the batter. Serve pancakes warm with Roasted Berries. Preheat the oven to 350°F/176°C. On a baking tray, toss the berries with the sweetener. Bake for about 10-15 minutes, until the berries are softened and oozing juices.